PTIPresident Pranab Mukherjee with French President Francois Hollande and Prime Minister Narendra Modi waves during an At-Home reception hosted by him on the occasion of the 67th Republic Day at Rashtrapati Bhavan. President François Hollande’s visit is the fifth such by a French leader to have been honoured as the chief guest at the Republic Day, more so than any other country. Equally significant, this was his second state visit (the first was in 2013), a trend that was started by his predecessor, Nicolas Sarkozy, who was chief guest at the 2008 Republic Day and returned for another state visit in 2010. With corresponding visits by Indian Prime Ministers, this annual summitry highlights the expanding areas of cooperation and convergence between the two countries. In independent India’s history of 68-odd years, we have fought five major wars, four of which were with Pakistan and one with China. The Indo-Pak wars went clearly in our favour, although the 1965 clash may not have had as definitive an outcome as we wanted. The Indo-China war of 1962 was a monumental fiasco, the ripple effects of which still resonate in our collective psyche. This disaster was, of course, documented by Australian journalist Neville Maxwell in his landmark study, India’s China War, published in 1970. The huge controversy surrounding this book was fuelled and exacerbated by the fact that Maxwell clearly had access to the top-secret ‘Henderson Brooks-Bhagat Report’ (HBBR), which is still treated as classified and top-secret by the mandarins in Raisina Hill. And we all know that the feisty Maxwell rubbed the government’s nose in the dust by releasing the first and operative part of the HBBR on the Internet in March 2014. For more than 13 years, ever since nearly 3,000 innocent lives were taken from us on 9/11, our nation has been at war in Afghanistan. Now, thanks to the extraordinary sacrifices of our men and women in uniform, our combat mission in Afghanistan is ending, and the longest war in American history is coming to a responsible conclusion. More than a year later, in President Obama’s final State of the Union address, concerning the progress of the mission in Afghanistan, he said … nothing. This is disappointing, but not surprising. The Obama administration often prefers to leave open difficult questions about U.S. failures to meet its goals. This leads to inconsistencies between White House messaging about the campaign and realities on the ground. NATO’s Resolute Support Mission (RSM) is the inheritor of ISAF and has become the main effort for coalition forces in Afghanistan. RSM is designed to train, advise, and assist senior leaders and headquarters in the Afghan National Defense and Security Forces (ANDSF) and the Ministries of Defense and Interior to do the kinds of things that armed forces need to do to maintain an army and sustain combat operations in the field. Editor’s Note: This article is adapted from the Heritage Foundation’s forthcoming Solutions 2016, a policy handbook for federal candidates that is being released today. Relations between the United States and Pakistan have ebbed and flowed over the last decade. Tensions peaked following the May 2, 2011 U.S. raid that eliminated Osama bin Laden, and the relationship hit its post-9/11 nadir in November of that year, when Pakistan cut off U.S. supply lines into Afghanistan after a NATO strike killed over two dozen Pakistani troops stationed along the Afghan border. U.S.–Pakistan ties have improved somewhat since then. Pakistani Prime Minister Nawaz Sharif and Chief of the Army Staff Gen. Raheel Sharif made separate visits to Washington last fall, during which leaders of the two countries expressed commitment to an enduring partnership. The United States also continues to provide substantial economic and military assistance to Pakistan. In Fiscal Year 2015, the U.S. appropriated around $371 million in security-related assistance and $468 million in economic-related aid for Pakistan. An additional $1 billion was authorized for Coalition Support Fund (CSF) reimbursements (payments for Pakistani military deployments and operations along the border with Afghanistan), although $300 million of CSF funding was withheld because of Pakistan’s failure to meet legislative conditions on the aid. Still, U.S. and Pakistani goals in South Asia remain far from aligned. At stake in the region are some of America’s most vital national security interests including: ensuring that neither Afghanistan nor Pakistan serves as a safe haven for global terrorists; keeping Pakistan’s nuclear weapons out of the hands of terrorists; and preventing war between India and Pakistan that could potentially go nuclear. The United States has made significant strides against the al-Qaeda core leadership, thanks to an aggressive drone campaign in Pakistan’s tribal border areas. However, the global terrorist threat emanating from Pakistan remains a major U.S. national security concern as a multitude of different extremist groups with varying degrees of ties to al-Qaeda continue to operate in and from Pakistan. At the height of combat missions in Afghanistan, the U.S. military occupied nearly 825 military outposts throughout the war-ravaged region. That number now stands at roughly 20. The outposts served an extensive intelligence-gathering network, using surveillance balloons and wide-range signals intelligence collection operations. The rapid drawdown of these facilities following the withdrawal of U.S. and NATO forces from the region created a black hole of information, with Afghan forces struggling to fill the gap. Afghan forces require a robust intelligence collection and targeting capability if they want to turn back the tide of a reinvigorated Taliban insurgency, which has occupied more territory since its collapse following the U.S.-led invasion in 2001. Currently, Afghanistan relies on a fledgling air force struggling to keep aircraft in the skies and lacking any precision strike capability to target Taliban and ISIS commanders. Aging Mi-25 and Mi-35 attack helicopters, provided by Russia and India, and theMD-530, a two-man light attack helicopter similar to the U.S. Kiowa Warrior, comprise Afghanistan’s air force. The nation lacks a dedicated fixed-wing, light attack aircraft capable of providing close air support to ground forces and delivering precision strike GPS-guided munitions—until the recent delivery of the A-29 Super Tucano. Resolute Support Mission commander Gen. John F. Campbell, USA, described the A-29 as a potential “game changer” for Afghan forces. It is slated to serve as a dedicated close air support platform for the Afghan forces struggling to hold back the Taliban. The aircraft can be retrofitted with GPS guided munitions kits for precision strike capabilities, turning it into a precision targeting platform that will require an advanced intelligence network—one capable of providing real time intelligence to battlefield commanders. This would include a buildup of Afghanistan’s signals intelligence collection capabilities and the exploitation of the electromagnetic spectrum, beyond the collection and triangulation of unencrypted VHF enemy communication that has helped Afghan forces locate enemy command and control nodes using the U.S. Army’s Wolfhound intelligence gathering system. – Section 1 focuses on the Afghan economy. Despite more than a decade of reconstruction and development efforts, the Afghan economy remains in fragile and worsening condition. Intractable insurgents, cutbacks in foreign military personnel, persistent emigration of people and capital, and a slowing global economy are shifting Afghanistan’s economic prospects from troubling to bleak. – In this reporting period, Afghanistan proved even more dangerous than it was a year ago. The Taliban now controls more territory than at any time since 2001. USFOR-A reports that approximately 71.7% of the country’s districts are under Afghan government control or influence. – The lack of security has made it almost impossible for many U.S. and even some Afghan officials to get out to manage and inspect U.S.-funded reconstruction projects. The dangers of absent oversight were exposed when a task force appointed by President Ashraf Ghani reportedly found that millions of dollars were being embezzled while Afghanistan pays for numerous nonexistent “ghost” schools, “ghost” teachers, and “ghost” students. – A group of 93 Members of Congress have asked SIGAR to conduct an inquiry into the U.S. government’s experience with allegations of sexual abuse of children committed by members of the Afghan security forces. – SIGAR’s work to date has saved over $2 billion for the U.S. taxpayer. – Afghanistan’s domestic revenues paid for 40% of budget expenditures through the first 11 months of the fiscal year. The country’s large budget deficits and trade imbalances will require substantial donor aid for the foreseeable future. – Cumulative funding for Afghanistan reconstruction increased to approximately $113.1 billion, with approximately $11.5 billion of this amount remaining in the pipeline for potential disbursement. A total of $8.4 billion of the reconstruction funding has been provided for counternarcotics efforts in Afghanistan. – This quarter, Afghan National Defense and Security Forces (ANDSF) assigned force strength was 322,638 (including civilians), this assigned-strength number reflects a decrease of 2,078 since July 2015 and 9,306 since May 2015. – Since 2003, USAID has spent at least $2.3 billion on stability programs in Afghanistan. The former defense secretary on U.S. gains forfeited in Iraq, America’s rudderless foreign policy and the ‘completely unrealistic’ Donald Trump. Many Americans probably had misgivings when U.S. troops were withdrawn from Iraq in 2011, but even the most pessimistic must be surprised at how quickly things went south. Turn on the TV news: Western Iraq, including the Sunni triangle that the U.S. once worked so hard to pacify, is in the hands of a terrorist group, Islamic State, radiating attacks as far as Paris, Jakarta and San Bernardino, Calif. The battlefield where the U.S. spent most of its blood has become swept up into the chaos of next-door Syria. Refugees from the region are destabilizing Europe. Proxy forces, shadowy groups and national armies representing half a dozen countries are fighting on the ground and in the air. The world seems one incident away from World War III in the vacuum U.S. troops left behind—as when NATO member Turkey recently shot down a Russian jet. Mr. Gates, along with President George W. Bush and Gen. David Petraeus, was a prosecutor of the troop surge, a decision unpopular even in the Pentagon to double down on the Iraq war in 2006. His 2014 memoir, “Duty,” which a New York Times reviewer called “one of the best Washington memoirs ever,” makes clear that the suffering of U.S. troops weighed more and more heavily on him as he served under President Bush and then re-upped under President Obama. At stake in South Asia are some of America’s most vital national security interests, including stabilizing Afghanistan and Pakistan and ensuring that neither country serves as a safe haven for global terrorists; keeping Pakistan’s nuclear weapons safe and secure and out of the hands of terrorists; preventing (potentially nuclear) war between India and Pakistan; and building a strong strategic partnership with India to enhance its ability to play a stabilizing role in the broader Asia–Pacific region. America needs to maintain diplomatic, economic, and military engagement in South Asia to protect these core national security interests. Afghanistan. There are currently around 13,200 U.S. and NATO troops in Afghanistan as part of Operation Resolute Support to train and advise the Afghan forces. NATO formally ended combat operations in December 2014, but coalition forces regularly conduct airstrikes in support of the Afghan forces, and American Special Operations Forces continue to carry out raids on Taliban and al-Qaeda hideouts. President Obama’s decision to extend the U.S. troop presence in Afghanistan beyond 2016 is welcome news, but he needs to drop all arbitrary deadlines for withdrawal. Despite his earlier pledge to withdraw all U.S. forces, except those necessary to protect the U.S. embassy, by the end of 2016, Obama announced in October 2015 that a force level of 5,500 U.S. troops will remain in the country when he departs office in January 2017. The 9,800 U.S. troops currently deployed in Afghanistan will now remain in the country through most of 2016. Freedom House’s index of freedom in the world is flawed — but the story it tells is indispensable. It’s January, which means we’ve just learned that freedom around the world is declining. This — for the tenth year in a row — is the conclusion of an annual report released earlier this week by Freedom House, the venerable human rights and democracy organization. Freedom lost ground in 72 countries in 2015, the report somberly concludes. This is the largest such number over this gloomy ten-year period, during which the percentage of the world’s population that lives in “free” countries declined from 46 to 40 percent. These annual “Freedom in the World” reports, which describe and numerically rate the state of freedom in every country on earth, inevitably generate buzz, and this year will be no exception. And it’s not just the media. Ministers, diplomats, Washington policymakers, U.N. bureaucrats, and other international wheelers and dealers will be paying close attention. There’s little doubt that diplomatic cables reporting the latest scores are already flying — and in some capitals (I’m looking at you, Budapest) you can almost hear the gnashing of teeth. In spite of all this commotion, the ivory tower regards the exercise with a mixture of skepticism and exasperation. In spite of all this commotion, the ivory tower regards the exercise with a mixture of skepticism and exasperation. Over the last decade, political scientists have produced a wealth of literature documenting the annual reports’ biases and methodological problems. Their conceptual basis is flawed; the data collection is opaque; the results are overly simplified; Freedom House has a neo-liberal bias. Jay Ulfelder, a political scientist and independent consultant, has convincingly disputed Freedom House’s overall findings — that freedom in the world is steadily declining — for two years in a row. Make an assessment of proposed AH-64 transfers from Army National Guard to the Regular Army. 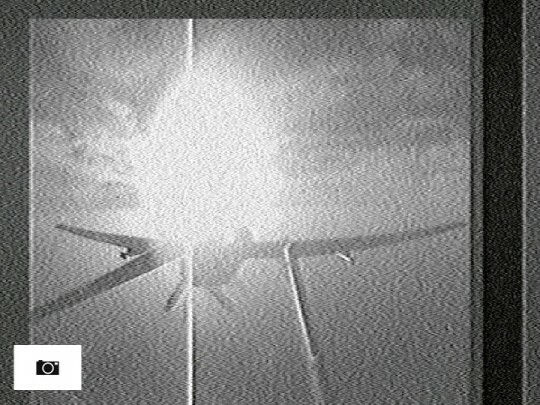 AMERICAN AND BRITISH INTELLIGENCE secretly tapped into live video feeds from Israeli drones and fighter jets, monitoring military operations in Gaza, watching for a potential strike against Iran, and keeping tabs on the drone technology Israel exports around the world. Several of the snapshots, a subset collected in 2009 and 2010, appear to show drones carrying missiles. Although they are not clear enough to be conclusive, the images offer rare visual evidence to support reports that Israel flies attack drones — an open secret that the Israeli government won’t acknowledge. The Intercept is publishing a selection of the drone snapshots in an accompanying article. Additionally, in 2012, a GCHQ analyst reported “regular collects of Heron TP carrying weapons,” referring to a giant drone made by the state-owned Israel Aerospace Industries, known as IAI. Anarchist operated from a Royal Air Force installation in the Troodos Mountains, near Mount Olympus, the highest point on Cyprus. The Troodos site “has long been regarded as a ‘Jewel in the Crown’ by NSA as it offers unique access to the Levant, North Africa, and Turkey,” according to an article from GCHQ’s internal wiki. 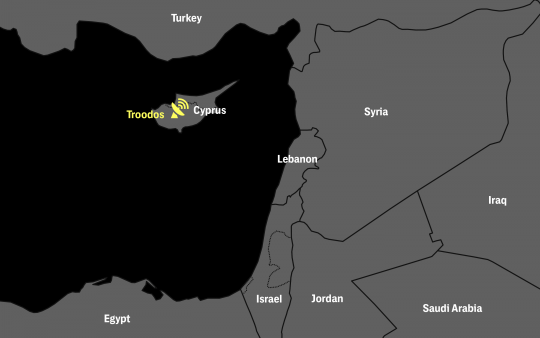 Last August, The Intercept published a portion of a GCHQ document that revealed that NSA and GCHQ tracked weapons signals from Troodos, and earlier reporting on the Snowden documents indicated that the NSA targeted Israeli drones and an Israeli missile system for tracking, but the details of the operations have not been previously disclosed. Andrew Small’s The China-Pakistan Axis: Asia’s New Geopoliticsdelivers a comprehensive assessment of one of the world’s most consequential, peculiar, and poorly understood bilateral relationships. Small weaves together his own interviews and travel observations with extensive use of other histories and narratives that touch on various aspects of China-Pakistan relations but, as he rightly observes, have thus far failed to deliver a full and up-to-date version of the story. 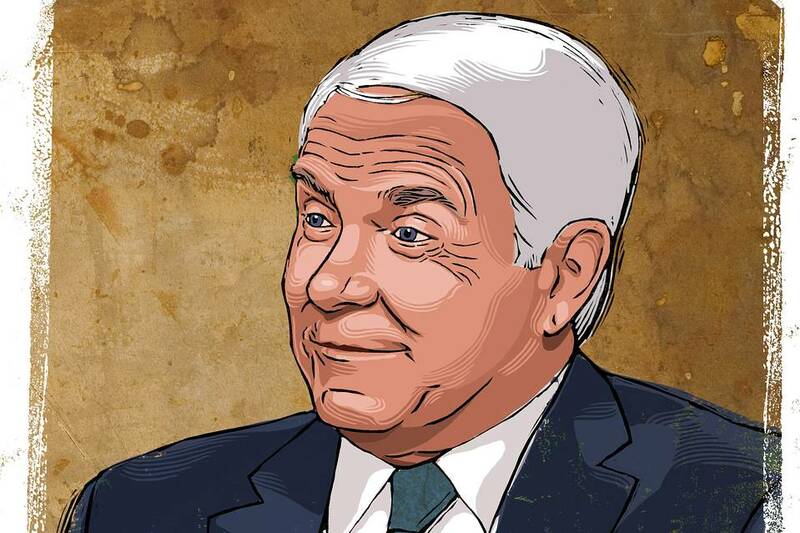 Small’s book took a half-dozen years to write, but its timing is nearly ideal. He concludes his history by observing that “the China-Pakistan axis is almost ready to step out of the shadows” (p. 181). It is now quite safe to remove the caveated “almost” from his phrase. China’s new One Belt, One Road initiative—the grand scheme to extend and improve interconnectivity throughout China’s western periphery through massive state-led investments—is finding its most important test case in the China-Pakistan Economic Corridor, where, according to Pakistan’s probably inflated accounts, China has pledged $46 billion in new investments over the coming years. The China-Pakistan Axis is truly one of a handful of books that must be read by professionals seeking to understand Pakistan’s past or hoping to catch a glimpse into its future. And as China’s own fate becomes more intertwined with South, Central, and West Asia, the book will be an increasingly vital resource for serious China hands as well. View full text of article. 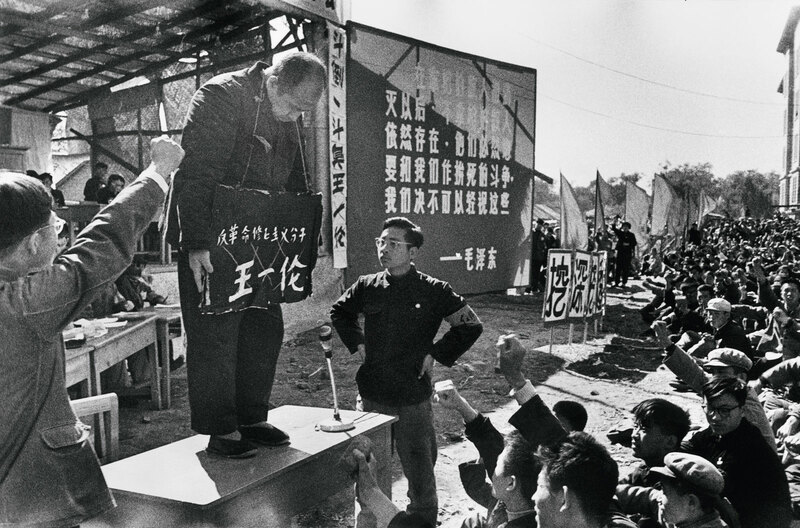 By now, it has been nearly forty years since the Cultural Revolution officially ended, yet in China, considering the magnitude and significance of the event, it has remained a poorly examined, under-documented subject. Official archives are off-limits. Serious books on the period, whether comprehensive histories, in-depth analyses, or detailed personal memoirs, are remarkably few. Ji Xianlin’s The Cowshed: Memories of the Chinese Cultural Revolution, which has just been released in English for the first time, is something of an anomaly. The relationship between the United States and the People’s Republic of China (PRC) is one of growing complexity, as American decision makers must balance necessary cooperation but increasingly intense competition. The U.S. must maximize the benefits of its economic relationship with China even as it maintains the alliances, partnerships, and forward-deployed military to balance China’s increasingly strident bid to displace it as the Asia–Pacific’s preeminent power. Only through applying the principles of free trade can the U.S. maintain its economic leadership, effectively manage the China challenge, and help to preserve peace, security, and freedom in Asia. China and the U.S., as the rising power and currently dominant power, respectively, are constantly competing with each other throughout East Asia even as the two economies continue to intertwine. As China’s strategic center of gravity has shifted to the coast, Beijing’s views of its “core interests” and fundamental national concerns mandate dominance, if not outright control, of the region lying within its “first island chain” stretching from Japan through Taiwan and the Philippines to the Malacca Strait. That the various East Asian states along that line are largely U.S. allies as well as major Chinese trading partners only highlights the complicated situation confronting U.S. decision makers in East Asia. Unlike the Soviet Union during the Cold War, the U.S. and Chinese economies are highly interdependent. While China has consistently run a large current account surplus with the United States (largely as a result of higher saving rates over domestic consumption between both nations), the U.S. currently enjoys a large capital account surplus with China. The importation of capital from China into the U.S. has provided enormous liquidity and a lower cost of capital for both consumers and businesses. This has resulted in a higher rate of gross domestic investment and economic growth. It is just politics to say current account surpluses are superior to capital account surpluses. Many think of aerial bombardment as a cheap, effective alternative to spilling American blood. They're wrong. The next president will need “more than tough talk or calls to carpet-bomb civilians,” declared President Obama in his final State of the Union address this month. He delivered a few well-placed barbs aimed at Republican presidential candidates and slammed Ted Cruz for his hard-line position on ISIS. After deflating the Texas senator’s call to bomb ISIS “back to the Stone Age,” President Obama said Cruz’s brand of bombast “might work as a TV sound bite, but it doesn’t pass muster on the world stage.” It was an interesting critique coming from a president whose Air Force flew 21,000 sorties over Iraq and Syria last year—9,000 of which involved “weapons release.” Altogether, more than 20,000 U.S. bombs were dropped in Iraq and Syria last year. If that doesn’t count as a massive bombing campaign, then what does? Obama’s strategy of bombing ISIS isn’t working. It isn’t that the bombs aren’t having any effect—they are, and they’re probably more catastrophic than the Pentagon will admit—but the act of bombing itself isn’t accomplishing what it’s suppose to: that is, reducing the number of ISIS terrorists while preventing as many civilian casualties as possible. Operation Inherent Resolve’s spokesman, Colonel Steve Warren, recently said: “If you’re part of ISIL, we’ll kill you. That’s our rule.” But the size of ISIS has remained relatively static, around 30,000 since 2014. And as far as avoiding civilian casualties, the Pentagon late last year gave the suspiciously low estimate of six civilian casualties during the entire bombing campaign. An independent investigatory group puts the number at something around 100 times that. The bombings may be helping troops on the ground—the Kurds and the Iraqi army—but is the assistance the United States is providing cost-effective? So far, the air war against ISIS has cost Americans around $5.5 billion, or about $11.2 million per day. If the current — and future — U.S. administration wants to battle the Islamic State, save Syria, and keep ties with Israel, it’s got to ditch the Cold War playbook. Do you know what the United States should do in the Middle East? The answer to that question used to be pretty obvious, but not anymore. For most of the past half-century, U.S. leaders knew who their friends and enemies were and had a fairly clear sense of what they were trying to accomplish. No longer. Today, there is greater uncertainty about U.S. interests in the region, more reason to question the support it gives its traditional partners, and no consensus on how to deal with the dizzying array of actors and forces that are now buffeting the region. One thing is clear: The playbook we’ve been using since the 1940s isn’t going to cut it anymore. We still seem to think the Middle East can be managed if we curry favor with local autocrats, back Israel to the hilt, constantly reiterate the need for U.S. “leadership,” and when all else fails, blow some stuff up. But this approach is manifestly not working, and principles that informed U.S. policy in the past are no longer helpful. Things used to be so simple — and no, that’s not just nostalgia talking. During the Cold War, for example, the central elements of U.S. Middle East policy were reasonably well understood. First and foremost, the United States sought to contain and, if possible, reduce Soviet influence in the region. It also wanted to make sure Middle East oil and gas continued to flow to world markets and that Israel survived, although the dysfunctional “special relationship” that now exists did not begin to emerge until the late 1960s. To achieve these goals, from 1945 to 1990 the United States generally acted as an “offshore balancer.” In sharp contrast to its military deployments in Europe or Asia, Washington didn’t station large ground forces in the Middle East and kept its overall military footprint low, relying instead on a variety of local allies and clients. In particular, the United States backed conservative Arab monarchies in Saudi Arabia, Jordan, and the Persian Gulf; had a close relationship with Iran until the 1979 revolution; and saw Israel as a strategic asset mostly because it kept defeating the Soviet Union’s various Arab clients. Indeed, a string of defeats and rising economic problems eventually convinced Egyptian President Anwar Sadat to abandon his Soviet patron and realign with Washington. The United States also played a balance-of-power game in the Gulf: Ronald Reagan and Bush 41 tilted toward Iraq during its war with Iran, and then Bush turned against Iraq when it invaded Kuwait in 1990. It is an understatement to say that 2015 was a terrible year for the Middle East: the humanitarian disasters spawned by the wars in Syria and Yemen continued unabated; the Islamic State expanded its terrorist operations throughout the region; and Iran accelerated testing of its ballistic missiles and increased its domestic oppression after agreeing to the nuclear deal that will provide Tehran with up to $150 billion in sanctions relief. Unfortunately, 2016 may already be off to an even worse start. On January 2, Saudi Arabia executed prominent Shia cleric Sheikh Nimr Baqir al-Nimr after his conviction on terrorism charges stemming from his support of mass anti-government protests in 2011. Iran responded by permitting mobs to attack the Saudi missions in Tehran and Mashhad. Saudi Arabia and other Gulf states subsequently cut diplomatic ties with Iran, thereby heightening the already deadly sectarian tensions sweeping the region. However, it is unlikely that these tensions will escalate into a shooting war in the near term. Saudi Arabia faces systemic challenges to its internal stability and is already militarily engaged in neighboring Yemen. Meanwhile, Iran’s conventional military strength still lags behind that of the Gulf states’ when U.S. military power in the region is taken into account. Yet rather than a military confrontation, the more probable threat is that Iran will launch a campaign that operates in the gray areas of hybrid warfare similar to Russia’s efforts in Ukraine. Given Iran’s penchant for operations that attack its adversaries’ soft targets while assuring Tehran a degree of deniability, U.S. policymakers should be concerned about the real possibility of a full-blown cyberwar emerging between Iran and our Gulf allies. Nikolai Patrushev, head of the Russian Security Council, said in an interview with Moskovsky Komsomolets that the United States was trying to weaken Russia in order to gain access to its mineral resources. He added that the "disintegration of the Russian Federation is not ruled out" by the United States. "This will open access to the richest resources for the United States, which believes that Russia possesses them undeservedly." Coming from a senior Russian official and former head of the Russian intelligence service close to President Vladimir Putin, this statement has to be taken seriously. This is not because the statement is true, nor even that Patrushev believes it's true, but because it gives us a sense of how the Russians are framing the ongoing confrontations with the United States and in turn, the reasons for Russia's problems. The United States is being framed as an existential threat to Russia's survival because of conscious, intentional U.S. strategies. As the Russian economy disastrously declines and real wages plunge, explaining the country's troubles as the result of the malignant intentions of an outside power shifts the blame from a failure of the Russian government to an American plot. The Russian government becomes the victim and the protector of the Russian people, who in turn are expected to rally behind the Kremlin. Putin has recently made several statements praising Josef Stalin. Stalin had miscalculated the Nazis' intentions and signed a treaty with them in 1939, only to then face a German invasion of the USSR in June 1941. Stalin used the invasion to create a bond between himself, the Soviet state and the Soviet people. Whatever questions the public might have had about Stalin's wisdom in being so unprepared for the invasion became unimportant. Germany threatened the Soviet public, the state protected them and only Comrade Stalin could keep the state and the people together. There is a link between Putin's slow resurrection of Stalin and the idea that the United States is plotting Russia's destruction. NOTHING excites the febrile intellects of Brussels more than analysing the theoretical underpinnings of European foreign policy. Entire tracts are devoted to the security strategy of the European Union, its neighbourhood policy, the countless “tools”, “instruments” and “levers” it has designed to help it advance its global concerns. A keen student can lose himself for hours in strategy papers and advisory memos to the policymakers supposedly shaping Europe’s place in the world. When the EU signed a German-inspired deal with Turkey to help stem the flow of refugees late last year, none of this mattered a jot. Presented by European officials as a hard-nosed piece of statecraft, the “action plan” offers Turkey money, the prospect of visa-free travel inside the EU and an acceleration of its membership bid so long as the Turks keep the migrants away. It was one of the most important European foreign-policy initiatives in years, but there was not a sniff of strategy to it. It reeked of desperation. 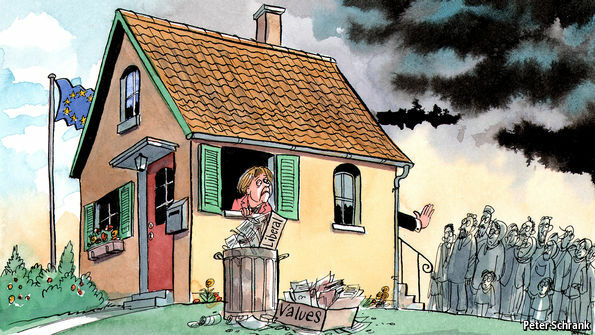 The deal seemed emblematic of a “realist” turn in European foreign policy. Ideas such as slashing aid to countries that refuse to accept the return of failed asylum-seekers are doing the rounds. Officials in international-development agencies tear their hair out as carefully nurtured relationships in Africa are tossed aside to make way for quick-and-dirty deals to ship back rejected migrants. Southern European countries fret that a plan to open EU markets to Middle Eastern exports (to create jobs for refugees) will crowd out their manufacturers. No threat facing America has grown as fast or in a manner as difficult to understand as has cybersecurity. The media vacillate between claiming that the threat is nothing but hype and panicked cries that the digital sky is falling. Neither position is correct. President Bush took strong steps to improve the overall security of the nation’s networks, and it seemed that President Obama was following suit. Securing cyberspace was a very early priority for the Obama Administration, which was wise enough to use former Bush appointees to set the tone and maintain some continuity, but the initial flurry of activity was not followed up in a consistent and effective manner. The main point of contention is the degree to which federal regulatory powers should play a role in cybersecurity. Many seem to think reflexively that this 19th-century solution is the answer. Those with a little more understanding of the dynamic and fast-moving nature of cybersecurity see regulation as far too slow and clumsy to be of any benefit and recognize that it might actually hinder security by building a culture of mere compliance with regulations and a false sense of security against enemies who are agile, motivated, and clever. Russia is the most sophisticated cyber threat, with China as a close second. China also has a strong desire to jump-start its economic efforts by rampant theft of commercial intellectual property. This fact is common fodder for the news media but is actually a greater problem than the news illustrates. Iran and North Korea are much less sophisticated than the two giants, but what they lack in expertise they make up for in malice. For example, the 2012 “Shamoon” virus unleashed upon the Saudi ARAMCO oil production company was a brute-force attack that destroyed 30,000 computers, and the recent cybersecurity breach of the Office of Personnel Management, a campaign believed to be undertaken by the Chinese government, resulted in compromised information of approximately 4 million federal employees. Attacks such as these have shown the U.S. that countries like China have the capabilities to inflict serious damage. North Korea has also used high-profile cyberattacks against the U.S., with the most notable being the one launched against Sony Pictures Entertainment, allegedly over a movie depicting North Korea in a negative light. The hackers took terabytes of private data and released confidential information to the public, including five Sony movies. To address this growing threat, the U.S. should leverage the forces of the market, motivating the private sector to make the sort of continual and dynamic investment needed to really secure our diverse networks. Heritage Foundation analysts have developed steps to do this that should be taken legislatively to begin the process of improvement that is so badly needed. SAN FRANCISCO (Reuters) - A U.S. congressional probe into the impact of a hack of Juniper Networks Inc software will examine the possibility that it was initially altered at the behest of the National Security Agency, a lawmaker said in an interview on Thursday. Since the attacks of September 11, 2001, at least 75 Islamist-inspired terrorist plots against the United States have been foiled thanks to domestic and international operation. In the war on terrorism abroad, Osama bin Laden and his deputies have been killed; the core of al-Qaeda has been flushed from Afghanistan and hounded in Pakistan (although tactical successes by the Taliban in 2015 show continued threat from terrorist groups in the region); and a number of affiliated groups across Southeast Asia, in part through U.S. counterterrorism assistance and cooperation, have been weakened. The U.S. has come a long way in terms of its readiness to prevent and combat acts of terrorism. Large investments in the Department of Homeland Security (DHS), the FBI, the intelligence community, state and local partners, and other government agencies have increased the U.S.’s ability to prevent terrorism before it strikes. While it is tempting to believe that the threat of terrorism has receded in light of these investments and improvements, the reality is that the threat is as present as ever. The “tides of war” have not receded, and new players have come to the game, namely, the self-proclaimed Islamic State (IS), also known as the Islamic State of Iraq and al Sham (ISIS), or ISIL, or Daesh. While there were successes, many resulted from more than a decade of efforts to make sanctuaries unsafe, cause attrition in the cadre of terrorist leaders, preempt planning and operations, disaggregate networks, thwart terrorist travel and communications, and disrupt fundraising and recruiting. With the recent rise of IS and other terrorist groups, Islamist terrorist activity has not only increased around the world, but also in the U.S. As Congress and the Obama Administration wrestle with the difficult decision of where best to spend precious security dollars, success in the war against terrorism and preventing terrorist attacks during the past decade are important priorities. 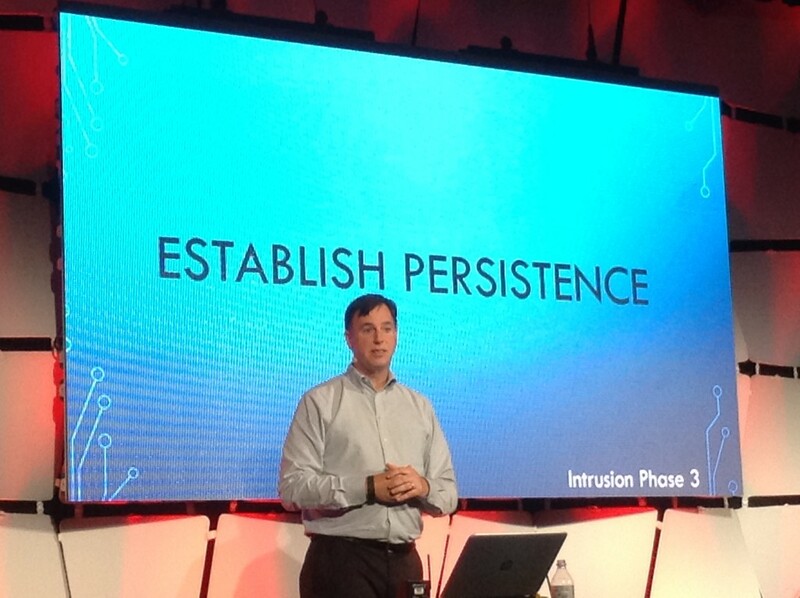 When Rob Joyce, head of the National Security Agency’s top hacking outfit, made an appearance at the brand new Usenix Enigma security conference in San Francisco this week, he didn’t strike the casual onlooker as an alpha predator. He had neatly parted dark brown hair with slightly graying sideburns, and he wore a light blue button-down shirt tucked into slacks. His demeanor more resembled that of a high school physics teacher than a dogged hunter. On Wednesday the hacker-in-chief, as Wired has dubbed him, delivered a rare talk at the event. In case there’s any doubt, when the nation’s top information infiltrator dishes on the dark arts of breaking into and entering computer networks, cybersecurity wonks stop whatever they’re doing. Ears perk up. People pay attention. His presentation was easily the confab’s main attraction. In this case, Joyce put on full display the awkward dual role of his employer: defending national computer systems, and exploiting the weaknesses in foreign ones. “I will admit it is very strange to be in that position up here on a stage in front of a group of people. It’s not something often done,” Joyce said, motioning toward his surrounding upon taking the floor. “My talk today is to tell you, as a nation state exploiter, what can you do to defend yourself to make my life hard,” he added. Secretary of Defense Ashton Carter on Thursday announced a series of new policies intended to support service members and their families, including expanding paid maternity leave and access to child care and family planning options. 08… The mythos of Special Operations has seized our nation’s popular imagination, and has proved to be the one prism through which the public will engage with America’s wars. From the box office to bookstores, the Special Ops commando — quiet and professional, stoic and square-jawed — thrives. That he works in the shadows, where missions are classified and enemy combatants come in silhouettes of night-vision green, is all for the better — details only complicate. We like our heroes sanitized, perhaps especially in murky times like these.